Kemerovo was founded on May, 9 in 1918. (On March, 27 in 1932 according to the enactment of the Presidium of All-Union Central Executive Committee Sheglovsk was given a new name – Kemerovo). Kemerovo is situated 3482 km away from Moscow in the south-west of Western Siberia in the center of Kuznetsk basin on the river Tom in its middle current where the river Iskitim flows into it. Kemerovo is divided into two parts by the river and its right and left parts are connected with one railway and two automobile bridges. Kemerovo is the second largest city in the region after Novokuznetsk in terms of population. 520 000 people live in it. 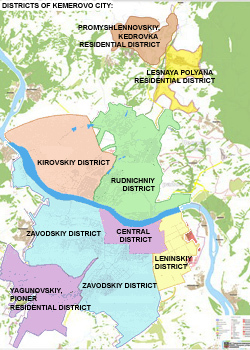 Kemerovo occupies the territory of 30 394,2 hectares. The population of the city equals to 18,4 % of the whole population of the region. Average age of the citizens is 37,8 years. Kemerovo is a big industrial administrative and cultural center of Kemerovo region. There is an international airport in the city. Kemerovo is situated at highway and railway crossing. The motorway of federal importance M 53 “Novosibirsk-Irkutsk” and the railway “Topki-Barzas” – the branch line of The West-Siberian railway cross the city. The railway station “Jurga” joins together Kemerovo railway station and The Trans-Siberian Railroad. There are 16 700 economical units in Kemerovo (according to the statistics on 1 January 2008). Manufacturing industry has the biggest share in the volume of forwarded goods produced in the city – 66,7%. Petroleum product and coke as well as chemical manufacture industry are the basic ones. They form 21,9% and 16,7% respectively. Generation and distribution of electric power, natural gas and water form 27,5%, while mining of mineral resources – 5,8%. Kemerovo is going to be developed according to the approved general plan, city concept, socioeconomic plans for medium- and long-term prospects up to 2021.